"Reiki is a life-enhancing art. For those suffering from illness, it is a means of returning to health. For the healthy it is a means of refining mind, emotions and body; calming the soul, clarifying the thought-processes and powers of perception; assisting suppressed creativity to awaken and blossom; and of revealing glimpses of our essential nature. Originally based in Sapporo, Japan, Kenji Hamamoto lived for a time in Brazilia, Brazil, before moving to South Korea where he currently resides. Since 2002, he has been practicing and quietly teaching what he has just recently begun referring to as Hekikuu Reiki - his personal 'understanding and expression' of the therapeutic art, based on almost two decades of practice. Hamamoto-san's initial introduction to Reiki (the 'Barbara Ray' variety) was thanks to Mieko Mitsui (who also taught Reiki to Hiroshi Doi), however he actually went on to train to master level in Usui Shiki Ryoho via apprenticeship with the Reiki Alliance, rather than via Barbara Ray's organization. Later, he also trained in Reido Reiki, and has, over the years, studied with a number of other Japanese Reiki Teachers. He has also been particularly inspired by the Reiki-related insights of a healer named Karasu-san. Hekikuu Reiki (Hekikuu translates as 'Azure Sky') is strongly informed by elements of Japanese 'Folk Spirituality', including a pragmatic, empirical belief in kami; and an understanding of the role of ancestral and other noncorporeal spirits as possible influencing factors in the manifestation of illness and dis-ease. This latter conceptualization gives rise to the practice within Hekikuu Reiki of frequently offering treatment for the particular ancestral or other spirits recognized to be associated with the presenting condition, prior to actually treating the client directly. Reiki is a power of the human spirit, a power of the human soul. It is the power, the ability to influence the flow of (life) energy to transform and heal." 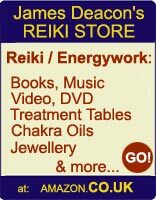 Hekikuu Reiki does not pretend to be "Reiki exactly as Usui-sensei taught". At the same time, it does not teach chakras, crystal work, or any other new age 'add-ons'. Rather, it teaches 'healing' and personal/social transformation from a perspective of traditional Japanese spiritual practices. "Reiki of the Spirit, Reiki of the Heart, Reiki of the Body." "First we must cultivate mindfulness. Receiving and giving Reiki is bound up with our own spiritual purification - the experience of receiving and giving Reiki enhances our own spiritual purification , and working on our own spiritual purification enhances our Reiki ability." While Hekikuu Reiki does not profess any particular Buddhist affiliations, practitioners make use of what may be described as a special, 'secular' version of Buddhist prayer beads or nenju* as a 'focussing device'. This (for want of a better term) 'Reiki nenju' - a tasseled string of 55 small beads - is also worn over the hand while giving treatment, and as is the case with its 'religious' counterpart, is considered to also manifest a protective influence for its owner (no doubt as a result of its continual exposure to the phenomenon that is Reiki). There are no extra symbols taught in Hekikuu Reiki - there are the 'standard' three symbols given at level 2, for use in a therapeutic context (Yet in Hekikuu Reiki, the HSZSN is not taught as a 'Distant' symbol but rather as one pertaining to the mental faculties); and the fourth 'standard' symbol is introduced at level 3, (however, while this is indeed the regular DKM symbol, in Hekikuu Reiki the symbol has a subtly 'non-regular' three-tiered significance). "To effectively assist the student to awaken to Reiki, the teacher needs to be present, needs to be able to watch for the physiological signs that the process is actually unfolding; to receive tangible energetic feedback. It would be disrespectful to the student to merely raise the hands at a distance, take their money, and hope." Level one training, which focusses on hands-on therapy, is open to all. While none of the 4 Reiki Symbols are explored at this level; the student is introduced to the first three in a series of kanji which Hekikuu Reiki uses purely for meditation purposes. [These are not ever classed as 'Reiki Symbols', and not used in giving treatment]. The student is also introduced to a number of other concepts including the importance of being 'fully present'; the significance of bowing; and they begin working with the Reiki Principles, learning to integrate them into their daily life from the outset. Level 2 is open to those who are seen to have immersed themselves fully in the experience of Level 1 - having significantly developed the 'potentials' conferred via the Level 1 'attunement/initiation' and training. As well as being introduced to the three Level 2 Reiki symbols, the student also begins to learn about the possible influence (not necessarily malefic) of spirits in the manifestation of illness and disease, and ways of therapeutically interacting with such influence. At Level 2 the student is introduced to a further three meditational kanji, and to further spiritual concepts which assist the student in deepening their 'awakening to Reiki'. Level 3 training is only open to those who are seen to have immersed themselves fully in the experience of Level 2 and have significantly developed the 'potentials' conferred via the Level 2 'attunement/initiation' and training. Level 3 in Hekikuu Reiki is not presented as a 'Master' level. It is rather a 'spiritual' focussed level, wherein the student continues to work with and fully incorporate all that they have previously learnt and experienced. The 4th Reiki symbol and its particular significance within Hekikuu Reiki is introduced at this level; and the student is introduced to yet a further three meditational kanji. The journey that is level 3 takes the form of an apprenticeship - a Sensei-Deshi relationship. "Though Usui-sama chose to share his Reiki-centred healing method with the world, permitting all to study and receive the gift that is the Usui Reiki healing ability, it can be seen that he did not intend for all people to learn all that his method entailed. All were taught Shoden, but only those who proved worthy were allowed to progress to Okuden; fewer still were considered suitable to enter into the Mystery Teachings. Today, it seems everyone wants to be a 'master' without even having begun to explore the surface, let alone grasp a glimpse of the depths and potentials that Shoden entails.